This tool has been developed to support community organizations, district platforms and local communities to follow the process of collecting local fees and taxes so as to have a basis for evidence-based advocacy for efficient collection process and accountability to the collected revenue is directed to service provision at the local level. After collecting the information and completing the matrix, it should be shared and discussed with the district government, municipality and local representative of the tax authority, civil society organizations and the community as a mechanism to follow up the findings raised focusing on type of fees and taxes collected locally, legislation and guiding documents, tax collection costs, tax collection forms, awareness that the citizen and/or family has about the payment of tax, where to pay fees and taxes and on the reason of paying taxes. Based on the findings, a document should be produced, no more than 3 pages, with recommendations for the local government. 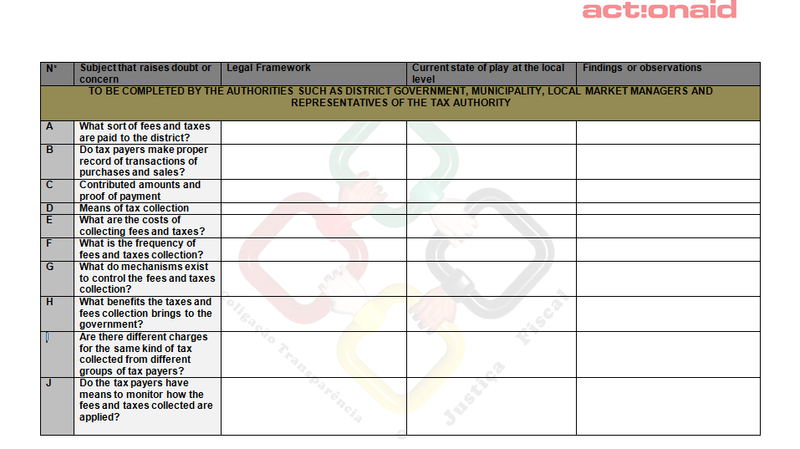 This tool requires much collaboration from the local authorities such as district government, municipality, local market managers and representatives of the tax authority who may not collaborate to the success of this tool. For instance, they may not complete the matrix or they may not read the recommendations addressed to them. Consequently, results will not be seen.